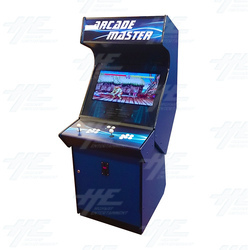 This commercial quality 26 inch Upright Arcade Cabinet is a JAMMA ready video game machine that features a HD LCD monitor, plywood and steel construction, and Japanese joystick and buttons! This is our demo/showroom model, sold in as-new condition with 12months warranty. Easily serviceable (all internal designs are plug and play, no need any technician or special tools) as all components are designed with plugs, and cabinet is either opened with key or latches so no need to dismantle the machine to gain access.